New requirements on Huffington Post, also known as HuffPost, are riling many users and prompting some to leave the website altogether. In order to “maintain a civil environment for real conversation,” the new requirements focus on getting users to create an account using their full name or their first name and last initial, according to Huffington Post. But the account must connect to a person’s Facebook, and the person’s Facebook must be verified. That means giving Facebook your phone number, because the only way to get verified on Facebook is through a text sent to your phone. 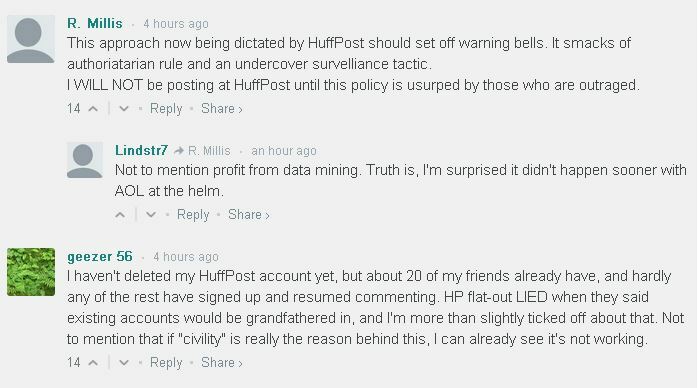 The move has upset many Huffington Post users, as seen in the comments on a piece by Poynter about the move. Poynter points out that among the top 50 news sites in the U.S., all but seven permit commenting via Facebook, but only three required a Facebook account to connect. Many websites use plug-ins that accept users from other social networks, such as Twitter and Google+. One user, “TheRewd,” said on the piece that he refused to become verified on Facebook because he didn’t want to give Facebook his phone number, and he was also upset for the connection. Tim McDonald, director of community for Huffington Post, explained the changes in a post on December 10. “When you log in to your account and go to make a comment, you will be prompted to link your commenting account to your verified Facebook account. Then, choose how you’d like your name to be displayed. You can either display your first and last names, or your first name and last initial. This is the only information that will be viewable to the community at large, and you will have control over your private information via Facebook’s privacy settings,” he said. The U.S. has over 500,000 elected offices, but the next generation has little desire to fill them.